Woke up this morning and the first thing I hear from mum is that its time to visit the vet for my 3rd jab. It was like just yesterday that I had my 2nd jab and today it's the 3rd one.... mmm how time flies. Anyway, mum bathed me today as the vet did tell her earlier that I can't take a bath for a week after the jab. He should have said 2 weeks or more, don't really fancy bath time. Left home around 2.30pm and the ride there took us about 40 minutes. 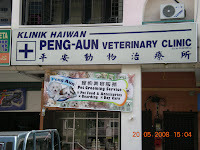 Dad took me to my regular vet, Dr Teoh from Peng Aun Veterinary Clinic in Sungai Dua, Penang. The moment we walked in, there were about 6 other dogs waiting. 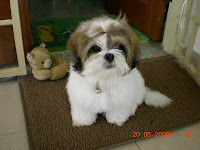 Mum was talking to another lady who brought her male Shih Tsu for checkup due to hair loss. Tried talking to him, but he's an arrogant fellow. There were another couple who brought their two toy poodles, but one of them was quite fierce, barking at a few of us. In fact, he was barking at all of us. Waited about an hour, then I was called in. Initially I was scared, shivering all over when they placed me on the stainless steel examination table. But the vet managed to calm my nerves. I think he managed to calm mum's nerve too, as she looked worried too. Of course the praises that the vet showered on me did help a lot, saying how cute I was and also mentioned that I've put on 1kg since my last visit. I'm now 3.56kg, hope I don't grow too fat. I was given a 10-in-1 jab, anybody wants to explain what's its for ??? It didn't hurt much though, just like an ant bite. 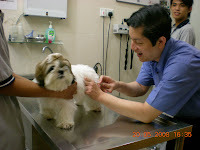 Came back about 5.15pm, took a nap and when I woke up, I felt sore where the vet put his needle in me! Gosh, I can't even run and jump to greet Sandra when she came back from school. Mum knew what was happening as the vet did mention that I might feel a little sore. Not being my usual self, I just lay quietly the whole evening. But that brought a lot of pampering from everyone and that makes up for the pain. 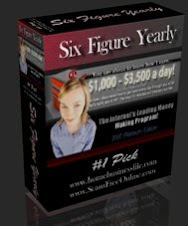 Make money on-line. Dog training. pu ppy training. 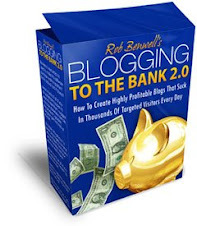 how to make money from your blog.